NearBus is a Cloud Connector that allows you to fully integrate in the cloud different MCU platforms (like Arduino, OpenPicus, etc.) in a very easy and transparent way. Installing a light agent (the NearAgent) in your MCU hardware the NearBus system will allow you to see the MCU as a real extension of the cloud, controlling it via the NearAPI (a very simple set of Web Services API functions). 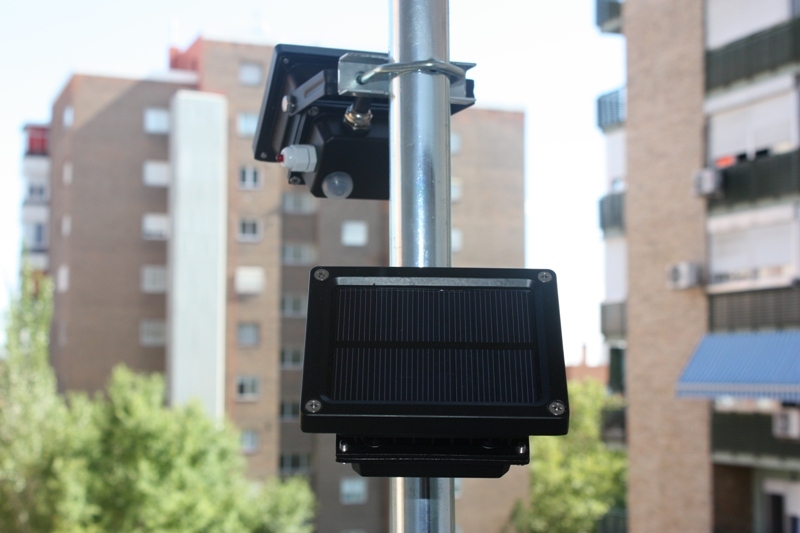 The picture shows two autonomous (solar powered) NearBus devices (GPRS and WiFi) under test. The active chart shows a real-time evolution of the solar cell current in mA for the WiFi device (the page should be reloaded to see the real time evolution). The system is located at 40º Latitude (N) and the time window is 12 hrs (UTC referenced). It's interesting to note the sinusoidal envelope of the signal. The NearBus system proposes a different paradigm to support the deployment of simple controlled devices. Instead of the traditional concept of "connect" a remote device to the cloud (to control it), the NearBus system "maps" the device into the cloud, doing a mirroring (or replication) of small part of the microcontroller's memory into the Cloud's memory. Under this paradigm, reading or writing on the Cloud's memory will have the same effect as if you were reading or writing directly into the microcontroller's memory, simplifying the way in which the device is controlled. This mirroring process between the Microcontroller's memory and the Cloud's memory is called the Memory-Map process, so under the NearBus paradigm we say that the remote device more than "connected" to the Cloud will be "Mapped" into the Cloud. The NearBus system has two main components, the remote device controller or NearAgent and the Cloud Hub manager or NearHub. These components communicate in a periodic way through the NearBus protocol. The main feature of NearBus system is to allow you to control the remote agent form the cloud via a simple set of web API functions known as the NearAPI. Additionally the Agent implements a NearBIOS code, a set of basic MCU functions (ADC, Digital I/O, etc.) that allows you to control the agent from the web in the same way as a traditional Microcontroller Unit. The following picture shows how the NearBus paradigm works at application level (eg. with a smart heater). The device is mapped into the cloud generating a virtual device, so the applications only need to access the device's mirror image to control it (the applications never access directly to the device). This system is intended to simplify the deployment of small devices and increase the security while freeing the high level programmers from the complexity of low level communications. 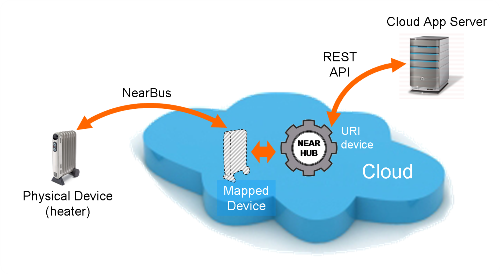 when the device is Mapped into the Cloud the NearBus System assigns a unique URI that identify the device through Internet (a web link to the device). Thanks to the RESTful API the device can be controlled with a simple web call. Note: Although the NearBus system has an extensive set of features, the video only shows two basic features of the NearBus system. For more detailed information about the NearBus System please refer to Overview section. The following picture shows how NearBus simplifies the integration of low level HW devices (eg. Arduino) with the top level Cloud applications, from professional environments like Google App Engine to DIY light platforms like IFTTT (www.ifttt.com). NearBus only is a cloud connector thought to hide the complexity in the remote devices connectivity (virtualizing they in the cloud). NearBus is not a programming cloud platform where you can deploy your applications. NearBus only offers you a simple, secure, and easy to troubleshoot way to connect your microcontroller platform to the cloud and control it through a simple set of web services (eg. REST API). 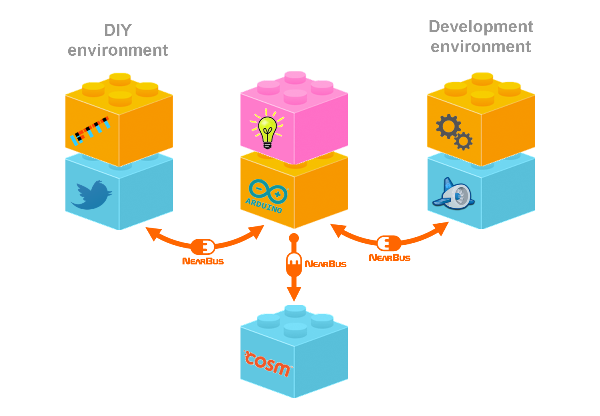 "NearBus, the easiest way to connect your Arduino to Cosm (Xively)"
» NearBus is an Open Project intended to be used with educational or development purposes, so we do not sell any of the hardware or software components that could be shown in this web site. » If you are interested in trying the NearBus system please follow the steps shown in the Hello World example (an Arduino Ethernet board is required). » In the HELP section you will find all the information necessary to install and run the NearAgent in your Arduino.